Do you have a tree in your yard that’s giving you grief? 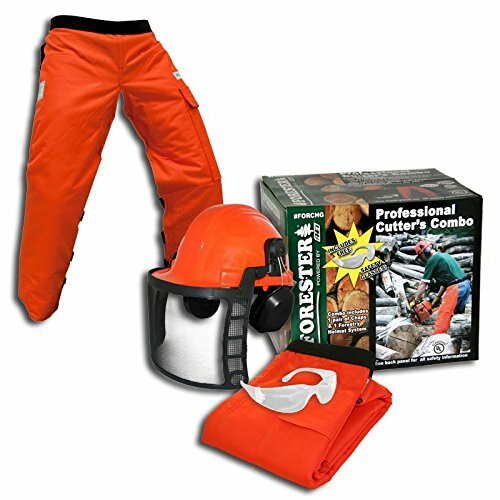 Ready to fell a tree on your property? 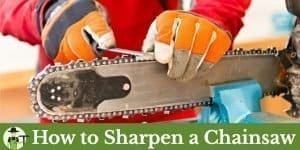 With the right chainsaw and some instruction, you can get this done quickly. However, it’s essential to do it correctly. 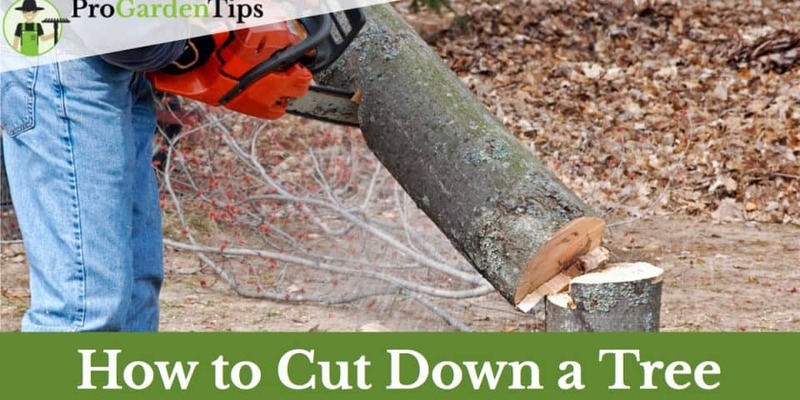 Check out the following guide to learn how to cut down a tree with a chainsaw. Hire a professional for rotten trees or if your home is near the tree. If the chainsaw gets stuck in the middle of your back cut, do not try to pull it out. Stop the engine and use a wedge to finish the job instead. Ask a friend to be a lookout for you on this job. This adds safety and could even save your life. Keep your safety gear on at all times. Debris can fly at hurt you anytime the chainsaw or wood moves. Better safe than sorry. If you want to cut down a tree, a chainsaw will make that job easier and more efficient. Follow these steps, and you can get rid of that tree quickly and safely. Happy felling! Don’t cut corners when you cut a tree, whether with a chainsaw or an axe. Every step is important to ensure your safety and the safety of the people and property around you. Be sure to think about each of the following safety precautions before you begin. Before you do anything with the tree itself, you should make sure you have the right type of chainsaw for the job. First, consider the kind of power on your chainsaw. For medium to large trees, a gas-powered saw is often best. These will give you the most torque. 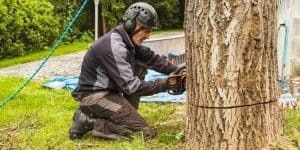 A battery chainsaw can be fine depending on the power and / or the size of the tree. Corded electric chainsaws are not ideal because of the power cord. It can be a trip hazard in stress full situations, and it will most likely get tangled in the branches especially whilst limbing and bucking the tree. Next, think about the length of the guide bar. For felling a tree, get something with at least 16 inches. Finally, consider purchasing a chainsaw with added safety features. 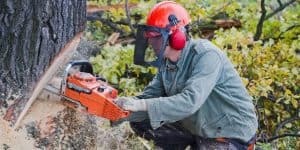 Anti-kickback features are of particular importance since kickback is the primary cause of chainsaw injuries. It’s important to make sure the chainsaw you choose is in good working order. It should have a sharp chain, and the whole unit should be clean and oil free. If you’re not sure about the sharpness of the chain, there is a simple test you can do. Take a spare piece of wood and make a straight cut with the chainsaw. Then, inspect the waste from the cut. If you see mostly dust, it’s time to sharpen the chain. However, if you get chips, the chain is ready for action. On a gas powered chainsaw, make sure the fuel and chain oil tanks are both full. If you own a battery powered chainsaw, make sure the battery is fully charged before you start. The last thing you want to happen is a flat battery halfway though the tree. Forestry Helmet meets ANSI/ISEA Z89.1-2009 Type 1, Class E, G & C/Screen meets Basic ANSI Z87.1 Requirements. Now that you have your personal safety covered, it’s time to think about the area surrounding the tree. Be sure that anyone near the tree knows what you intend to do. You may also put up warning sounds around the felling area to be sure the falling tree does not hurt anybody. To do this, you must determine the area of the fell zone. Don’t be fooled into thinking that the tree is smaller than it is. You can use the old ax trick to get a good idea of how far the tree will reach when it hits the ground. Face the tree and hold an ax blade down at arm’s length in front of your face. Then, close one eye. Slowly and carefully back away from the tree until the top of the handle looks even with the top of the tree and the base of the tree appears level with the bottom of the ax. That’s about how far it will fall. Once you’ve determined the fell area and the direction, you can decide on two escape routes to use if things go wrong. Then, you’re safer than before and ready to learn how to cut down a tree with a chainsaw. Don’t rev up that chainsaw just yet. There are plenty of decisions you must make before you get to cutting. The first thing you should determine is which direction the tree should fall. Don’t guess at this. Be very precise in this calculation. First and foremost, look around the tree to determine which direction it could fall without hitting another tree. If the falling tree hits a standing tree, it could jet backward and impale you. When you think you’ve decided on a direction, use the ax trick to see if it may work. Next, you should think about the way the tree naturally leans. In almost all cases, it’s simpler to fell the tree in the direction in which it leans. You may also consider the terrain around the tree before you decide on a felling direction. If it is near a hill, think about the possibility of the fallen tree rolling. Having a friend or family member pulling a rope attached to the tree helps making sure the tree will fall in the right direction. Make sure to leave a hinge of about 10% of the diameter of the tree. The person manning the rope should be able to pull the tree over now. Now that you’ve chosen a direction to fell the tree, you may feel tempted to get started with the chainsaw already. However, an important part of knowing how to cut down a tree with a chainsaw is knowing where to stand when the tree falls. Thinking this far ahead can keep you safe. Remember that the tree can move directly backward as it falls, so you won’t want to stand there. Of course, you should not stand near the fell line either. Instead, move about 45 degrees either way from your cutting position. You can mark this place before you begin if you wish. Your felling retreat should also be a few feet away from the tree. This step may keep you safe from debris that can fly as it falls. 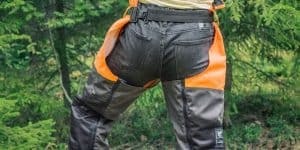 Remember to keep your safety gear on during this time as well. 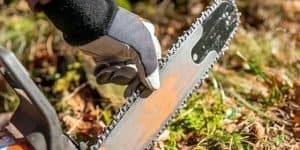 Now that you’ve learned the beginning stages of how to cut down a tree and make your plans, it’s just about time to fire up that chainsaw. The first cut you will make is a notch on the side of the tree that you want to fall. For example, if you want the tree to fall directly north, you will make this notch on the north-facing side of the tree. The notch should go about one-fifth of the way through the trunk. Before you power up the chainsaw, be sure to plan the notch. First, you want to cut at a height that is comfortable for you. Remember that you can always shorten the stump later if need be. Then, place the guide bar at the height you wish to cut. Make a small incision that will let you know where the center of the notch will be. From there, you can mark the places for the top and bottom cuts. The top cut should be about a 60-degree angle from the hinge of the notch, and the bottom cut should make a 30-degree angle. Once you have scored these marks, you can get cutting. Always make sure to cut the top line of the groove first. Go at a 60-degree angle and stop when you’re about one-fifth of the way through the tree. Then, do the same on the bottom cut at a 30-degree angle. Once the two cuts meet, the notch should simply drop out. Make sure to not make the notch too small.If the notch is not big enough, there isn’t enough space in the notch for the tree to gain enough momentum and successfully fall. Be sure that when you cut the notch, you stand beside the tree, not directly in front of the area you cut. This process will help you avoid serious injury. Some people get very nervous at this stage, afraid the tree might fall already. There’s absolutely no need to be, as long as you keep the notch less than a third of the tree’s diameter. More experienced tree fellers might cut bigger notches, up to two-thirds of the total diameter. I would strongly advise against doing this for most people. This technique carries much higher risk. There is more than one way to notch a tree. 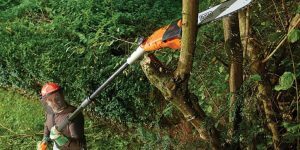 While the method above is popular and great for big trees, you may choose from a few other ways to create the hinge you need. In all cases, stand to the side of the tree when you cut and score before you make the final cut. Conventional: In this notch, the bottom cut is parallel to the ground, and the top cut comes in at a 45-degree angle. These two cuts should not meet. Instead, they should be about one inch apart from the meeting. Humbolt: this is the reverse of the conventional notch. The bottom cut should be at 45 degrees while the top is flat. Again, they should be one inch away from meeting in the middle. Open-Faced: This cut is the easiest for many beginners. The top and bottom cuts should be parallel to the ground with a 90-degree corner in the back. No matter which notch you choose, you will need to make a back cut, also known as the felling cut. This cut should be directly opposite to the notched side of the tree. This will be the step that disconnects the tree, so it’s important to pay close attention. Get your chainsaw going and start on the side of the tree. Work your way to the back. Be sure not to get too close to the inner angle of the notch you made in step four. This cut should not get within two inches of that angle. Don’t be afraid to check your work as you go. You’re not in a hurry. It’s better to do it right slowly than to do it wrong quickly. As soon as you feel the tree toppling over, remove the saw and turn it off. Quickly move away from the tree along one of your escape routes. This is where your previous planning will come in handy. Whatever you do, never take your eyes off the tree. You should always know where it is and where it’s headed. Once the tree has stopped moving, you can confidently say that you know how to fell a tree with a chainsaw. Congratulations! To make removal easy or to create great firewood, you will need to limb and buck the tree. Follow these steps, and you can be done with this job. Limbing is the process of removing the branches from the recently felled tree. Be sure the tree is on solid ground before you begin this process. You can choose to use either the bottom or the top of the bar, whichever is most comfortable for you. Start at the bottom of the tree and work your way upwards, safely removing limbs as you go. For particularly difficult branches, you can cut on one side, then the other, alternating until it is completely removed. If some limbs are bent under the tree, simply rotate the tree when you are done with all the limbs you can reach. Be careful; these limbs may snap back as you move the tree. If there are large branches under this kind of tension, start from the outside and work your way toward the trunk. Once you have removed the limbs, you should have a large, clear log. That can still be remarkably difficult to remove. You can cut this tree into smaller logs through a process called bucking. If the log is completely on the ground, cut as far into the log as possible. Then, rotate it to make the final cut. If one end is elevated, you should start the cuts from the bottom and finish them on top. You can make your logs into whatever size is manageable for the equipment you have.